Now, users can log into MyJohnDeere.com and access key applications such as JDLinkT, which allows you to view real-time information about your farm operations, field locations, and important performance data on your equipment. In addition to viewing and managing this important information, MyJohnDeere.com makes it easy to share the data with trusted partners, such as your John Deere dealer, farm manager, crop advisor, banker, or other third-party individuals. 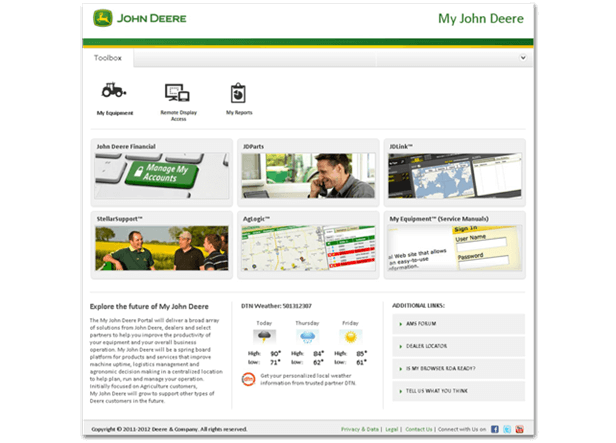 MyJohnDeere.com is the new platform for products and services that will help you improve machine uptime, logistics management, and agronomic decisions. As new products and services are made available in the future, you'll be able to access them from this single, user-friendly website.